It's been a year full of blessings, ups, downs, style, love, loss of love, grieving, celebrating and 100 other descriptors that fashion this amazing thing called life. 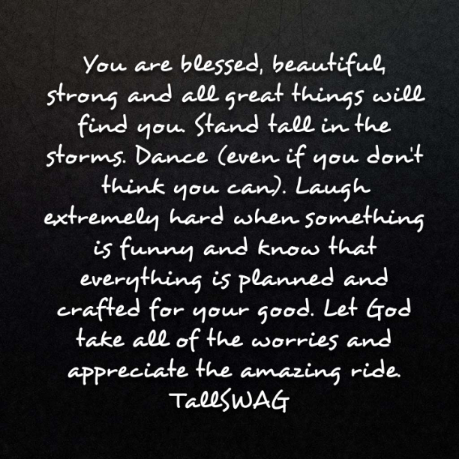 Every email, read of and comment on TallSWAG has strengthened me, my purpose and every step that I have taken in 2013. I am honored to share my life with you and can't wait to share more together in 2014. With that said, I am not going to list my "top looks" of 2013 or tell you what my resolutions are. I just merely want to say that no matter what happens in 2014, you are blessed, beautiful, strong and all great things will find you. Stand tall in the storms. Dance (even if you don't think you can). Laugh extremely hard when something is funny and know that everything is planned and crafted for your good. Let God take all of the worries and appreciate the amazing ride. This is my wish for you and for me in the new year and all of the years after that. We are beautifully and wonderfully made and should always live life to the fullest every single day of the year. So raise your shirley temples and cheers to what is to come because it's going to be extraordinary and we will be together for all of it! Happy New Year my tall, beautiful friends:) 2014...here we come!